On the 13th of July 2015 I discovered a clear text base64 transmission of credentials vulnerability within cookies in QNAP TS-x09 Network Attached Storage devices. Full disclosure was undertaken with the vendor and a CVE-ID has been requested from Mitre. A plaintext storage in a cookie vulnerability exists in QNAP TS-109/209/409/409U Turbo NAS devices, including Standard, II, PRO, and PRO-II models running <= Version 3.3.3 Build 1003T. By default, the devices store the username and password credentials within the cookie using base64 encoding. This vulnerability has not been reported for the QNAP TS-x09 devices, however has previously been reported for similar devices by Sense of Security. – Emailed vendor full vulnerability details via PGP email. The QNAP NAS Management Software, embedded as firmware, is accessible via a web-based interface on all Turbo NAS devices. A vulnerability exists in the method the devices store the username and password credentials using base64 encoding. This attack is amplified by a reflected XSS vulnerability (CVE-ID-requested) and the lack of the HttpOnly flag utilisation. An attacker may exploit the vulnerability to obtain authentication credentials via sniffing and intercepting network traffic. 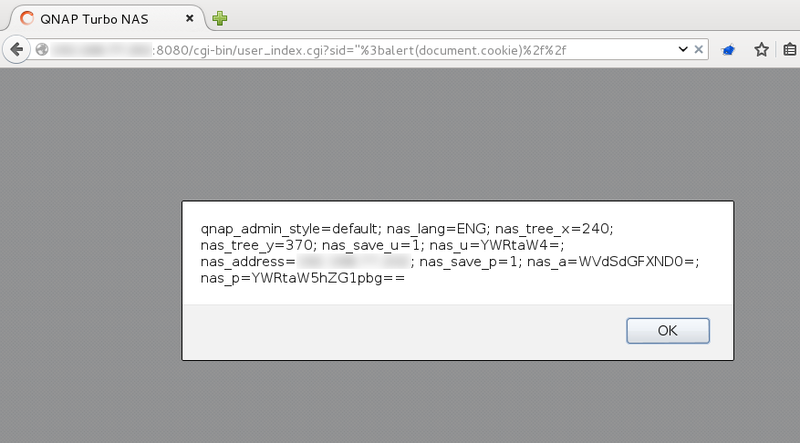 The nas_p contents in this cookie contains both the username of ‘admin’ and the password of ‘admin’ in a single string. Should the user tick the “Remember username” checkbox, other variables will be exposed in the cookie. nas_u contains the base64 encoded username, and nas_a contains the username base64 encoded twice. Example amplification of exploit when combined with my previously reported reflected XSS vulnerability.